Today is a big day! We are publishing our first interview and, of course, it was up to me top prepare it. I’m the Alpha Male after all. OK, also a drama queen, but still I must lead the gang into battle. And we’ve picked a lady for the first interview. I mean it was logical: we are four boys and what other way of making lady friends than interviewing them?! Oh, but I’m already talking to much about myself and you may get bored. So let’s get to business. Kirk: Hi Maggie! Please introduce yourself. Maggie: I was born in the wee hours of September 7, 2013. Mama was at her nephew’s first birthday party when she found out she was my mama! 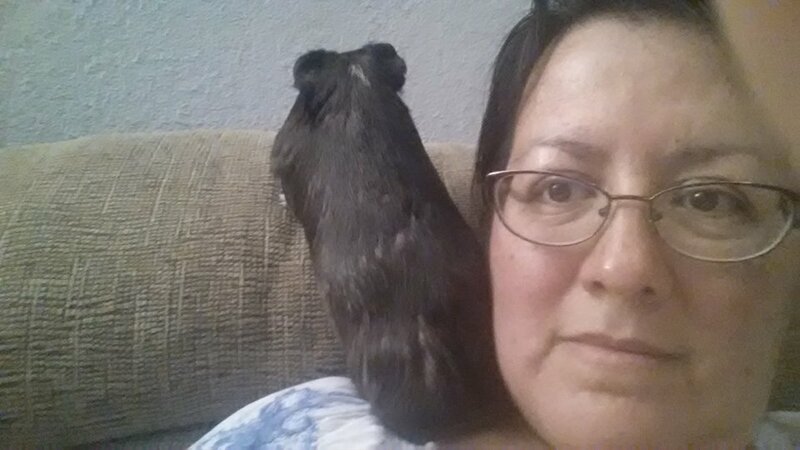 My fancy cavy name is “Black Magick’s Maggie.” Black Magick is the name of the caviary I came from. 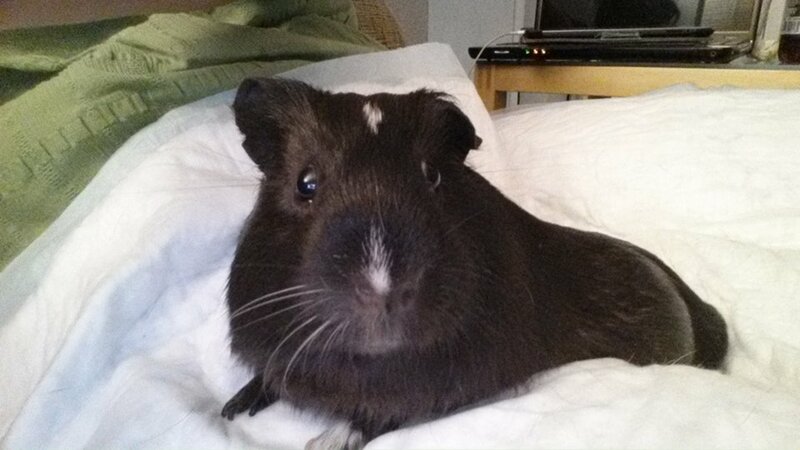 I am a self chocolate Peruvian purebred sow. I have dark ruby cast eyes. 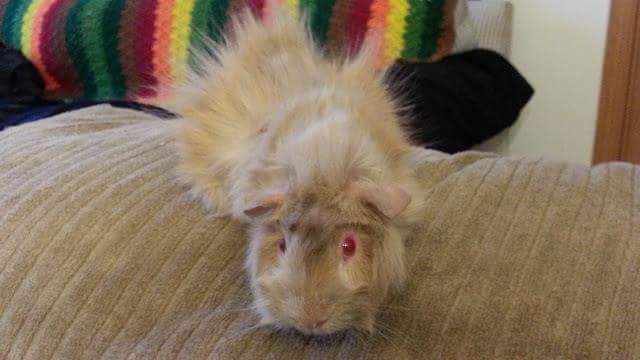 I wasn’t registered with the American Cavy Breeders Association because mama has a softie spot and wouldn’t pierce my ear with a metal tag. She also never intended to breed me. 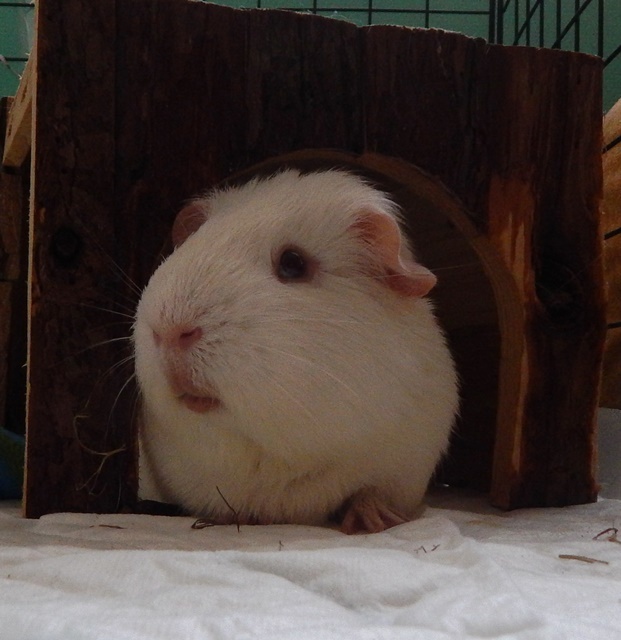 *WHEW, WHEEK! * My breeder says that I am as pure as the royal family. Mama picked four names out before I was born. The favourites were Foucault for a boy – after a French psychiatrist – and Maggie for a girl – after Margaret Atwood and Margaret Sanger. (Mama is a feminist.) 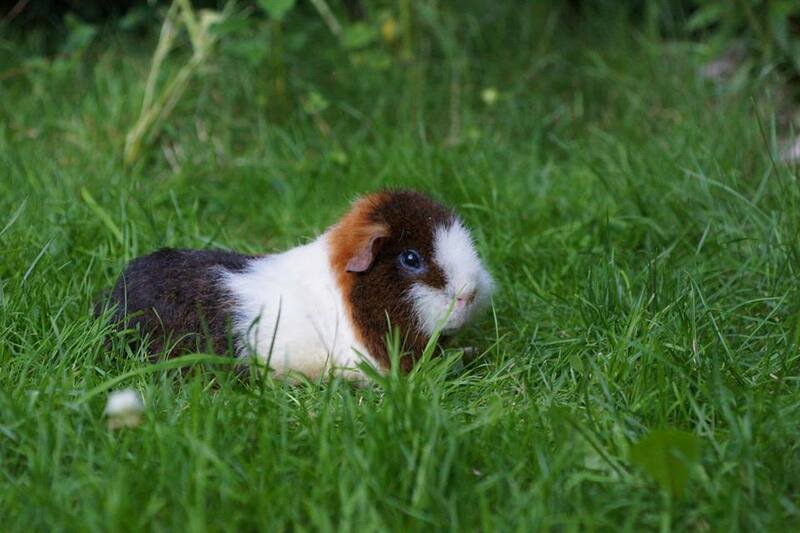 I am a retired show pig. I was shown a few times in the Ontario Cavy Club and took two best of variety awards. 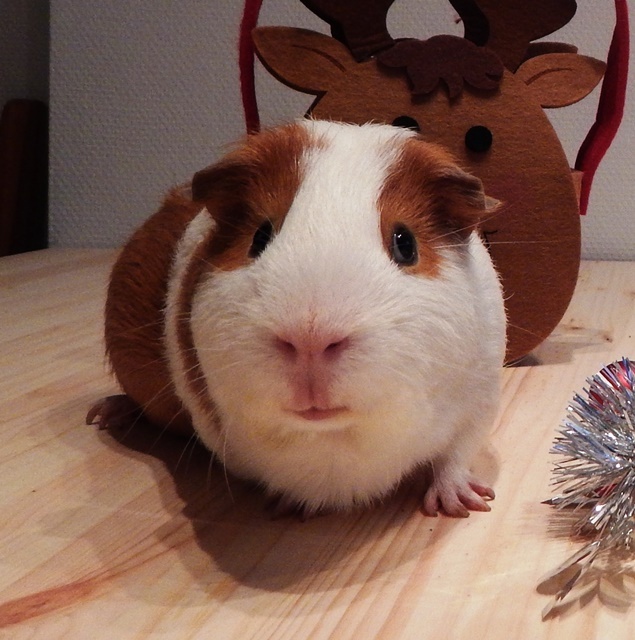 I did not like being around other pigs, but I never bit a judge. Mama liked this club because they use tape to put numbers on our ears. I was the only chocolate Peruvian – I am special and unique. I have been to two cavy conventions with mama. My first show was when I was 10 wheeks old and mama had already trained me to sit still on my show board. I am a smart cookie. Kirk: How and when did you pick your human? Do you think it was a good choice? Maggie: Mama and I met when I was 3 days old. I think it was fate. She was waiting to love a piggie with her very big heart. 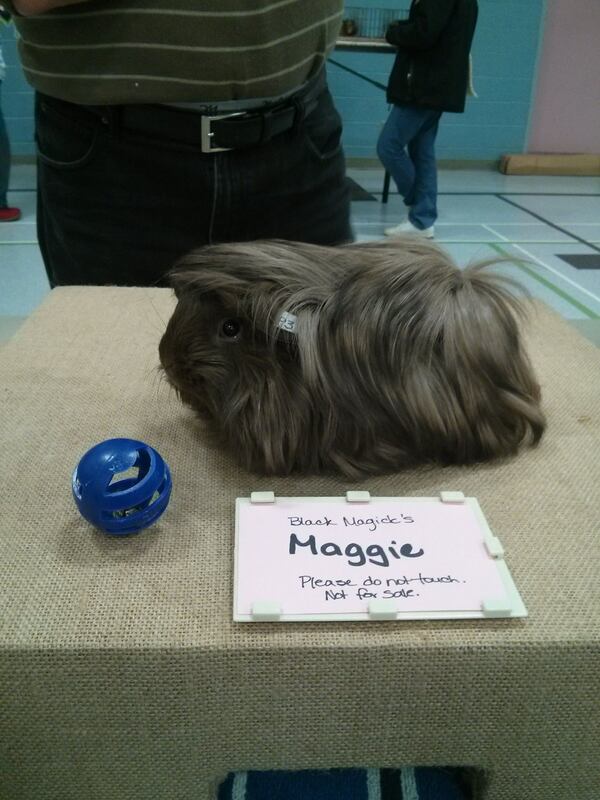 She was looking to meet a healthy boy pig to show in cavy shows. My sister and I weren’t boys, but I made her heart melt. I was very teensy and I sat in her hand. I had attitude and she kept coming back to see me, LOTS, until I was four and a half wheeks old. She also brought her bird to meet me and we became friendly. I was a little scared, but she took me home and has been spoiling me rotten ever since. Why do I think it was fate? A couple reasons. I am aggressive, especially in my cage. Breeders don’t like that. I might have been put to sleep if mama didn’t pick me! *GASP* Mama has studied behaviour psychology and behaviour modification for humans. She spent a lot of time training me and loving me unconditionally. I have also got a lot of bladder and tummy troubles. For the past 6 wheeks, she’s been following a medicine plan from my vet. Sometimes medicine 3 times a day, plus probiotics, plus weighing my veggies and giving me water in a syringe! Some people say that piggies aren’t worth the trip to the vet’s. It was fate that mama picked me. A trip to the vet’s is the easy part. Kirk: I can barely imagine how a lady like you could be aggressive… But let’s go on. How are your days going? Maggie: Now that I’m feeling much better, my days are pretty great. Mama says it’s like I’m a different pig. I sleep in the open a lot more and I watch mama. 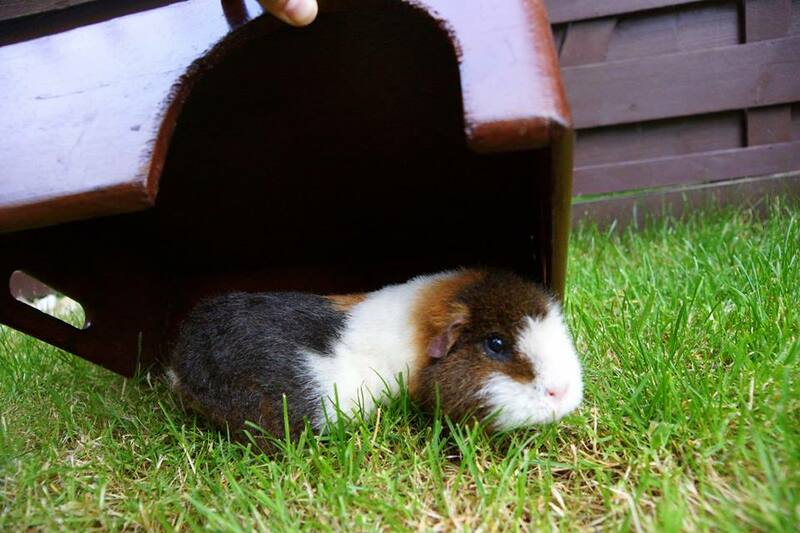 I stand up on the sides of the cage and on the Lego house to get lovin’. 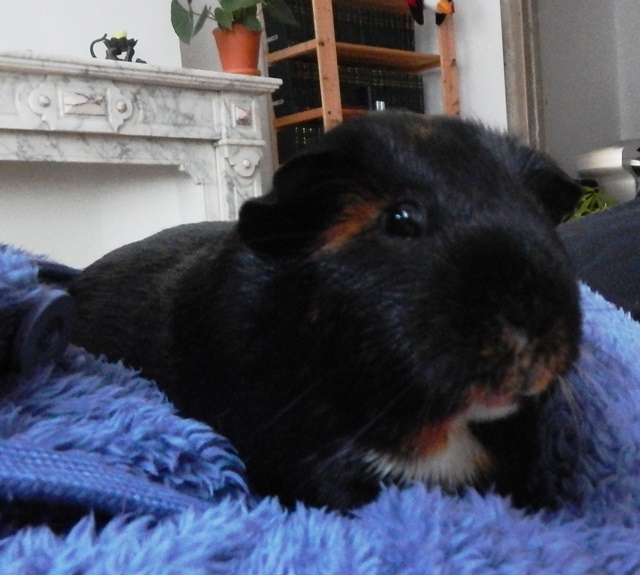 When I want to be picked up, I lay down with my head on the fleece. Mama always notices. I like to go outside with her when it’s cooler and talk to the neighbours. She brings treats with her when we go out, because she tries very hard to make me socially acceptable. No biting! She gives me lots of praise when I sniff someone and say hello. Sometimes we visit greenhouses and talk to the staff. Sometimes we pick up nana from work and I sneak upstairs in the elevator! Her building is with the Royal Canadian Mounted Police (RCMP) and the officers often think I’m a baby all cuddled up in blankets. Surprise! She takes me to three different pet stores where I have friends. One pet store has birds that I can get up close to and I think they are fun to watch. I really like to be close to mama and watch television. I like the smooth talking home renovator shows and NCIS. Kirk: Was it difficult to train your human to respond to your needs? Maggie: Mama is very intuitive because she stays home a lot with me. She says that I’m predictable. For example, I tell her I need to pee by tugging on her shirt collar, always on her left side. She gets right up and puts me back into my cage. I get sad when I pee on her shirt. I cry. If I’m on nana though, I get a little crazy dance going on. Nana doesn’t understand that it’s an emergency if I pull on her shirt. Mama sees my crazy hip shaking dance and picks me up so I don’t pee on nana. She knows when my tummy is troubling me because she says I act differently and I talk differently. I think that’s special because she tries to fix me before I have really bad stasis. She is smart and takes me downstairs to pick veggies in our garden just before Jeopardy comes on TV. She makes herself tea and we dine in her bed. 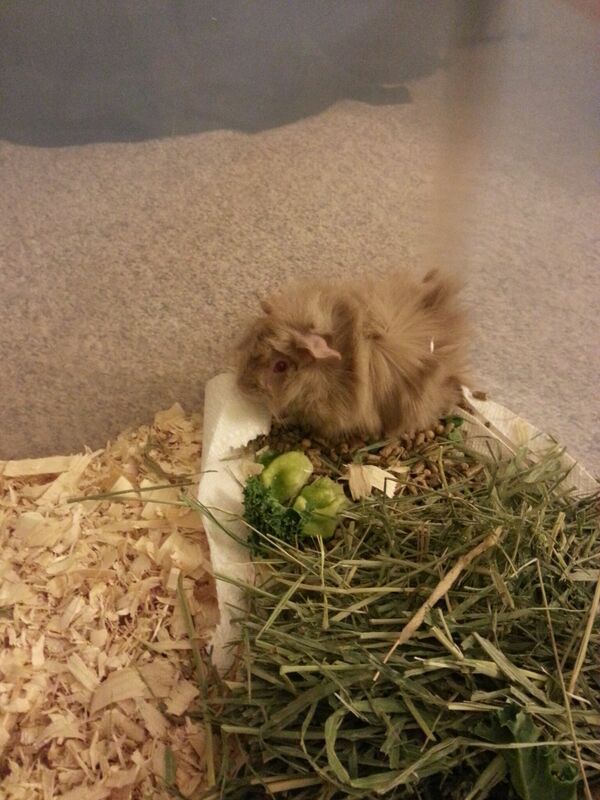 I trained her so well that she planted me a huge garden outside and I can share with my guinea pig royal family. We still go to visit! Now, I have to tell you something really special about her. I love noodle rugs. She found me my favourite one last year; it’s purple and perfectly sized to hold me, my food bowl and it soaks up my water bottle drips. 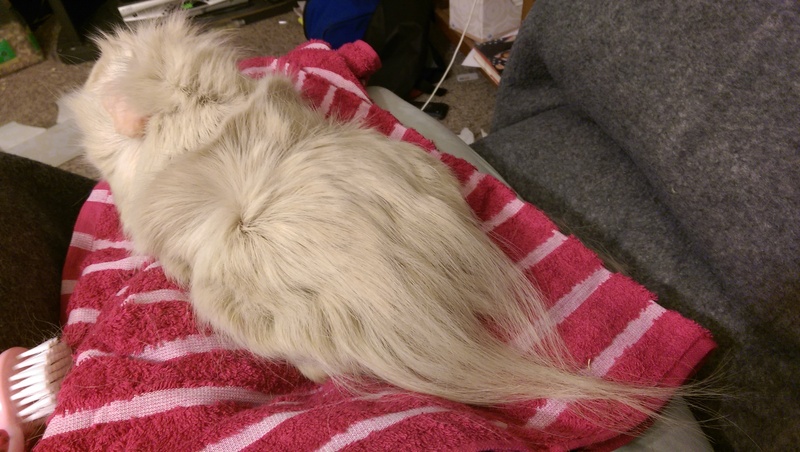 She washes it once a week and then it’s fluffy. I can lay on it and you can see where my body was. Mama keeps finding other rugs, but they’re not the same. She went to a store an hour away and brought me home a MASSIVE one and now I have a noodle rug for veggie time. She had to wash it a few times to make it smell like mama. But now I like it. I have to work on one thing. Sometimes I’m sleeping on my fleece and she tries to pet me. I’M SLEEPING!!! Don’t scare me so. I sleep with my eyes shut sometimes, so she forgets that sometimes I’m sleeping with them open. She likes routines and I like her routines. Kirk: I see that you have a very nice hairstyle. I mean I’m not a specialist, but it looks amazing. How do you manage to keep it this way? 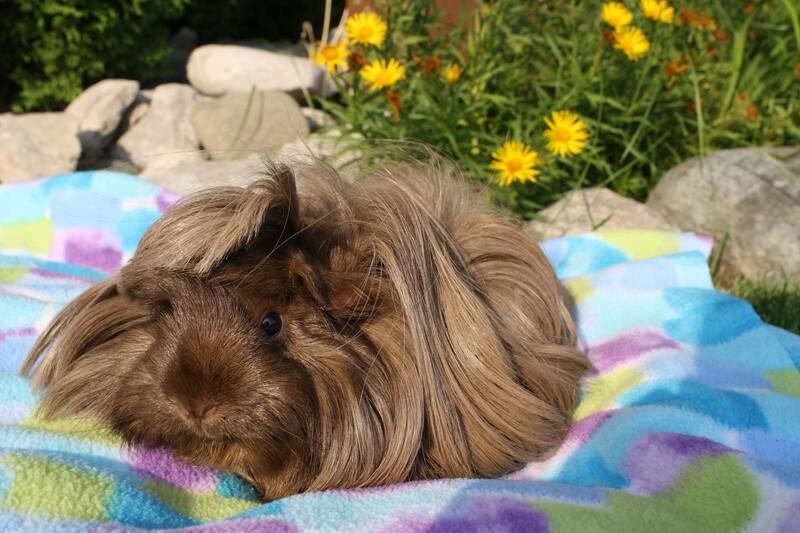 Maggie: Mama is very well trained in piggie hairstyling. My breeder taught mama all about Peruvians before she would let mama take me home! She is a groomer by trade, but mostly spends her time doing doggies. We Peruvians need a little more TLC than you smooth coat boys do. Mama had only had smooth piggies before – only one of them ever needed a bath, and it was for his dirty bum. Like you guys! I get regular baths, depending on how dirty my hair gets. Usually between 2-4 weeks apart. It’s easier to stay clean in the winter when my humans aren’t hot and sticky, you know? Mama is a shampoo collector. She has itchy shampoos. Smelling good shampoos. Conditioners for when I have longer hair. Sometimes when I’m being kind of mean, she uses a lavender shampoo to help me relax. 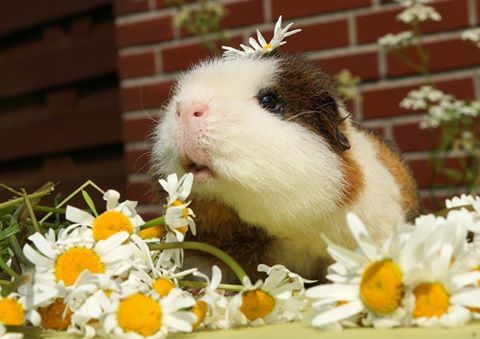 Guinea pigs have PMS, too. Mama bought special human hair scissors to cut my hair. She uses a bucket for me to stand on so she can give me a pretty haircut. 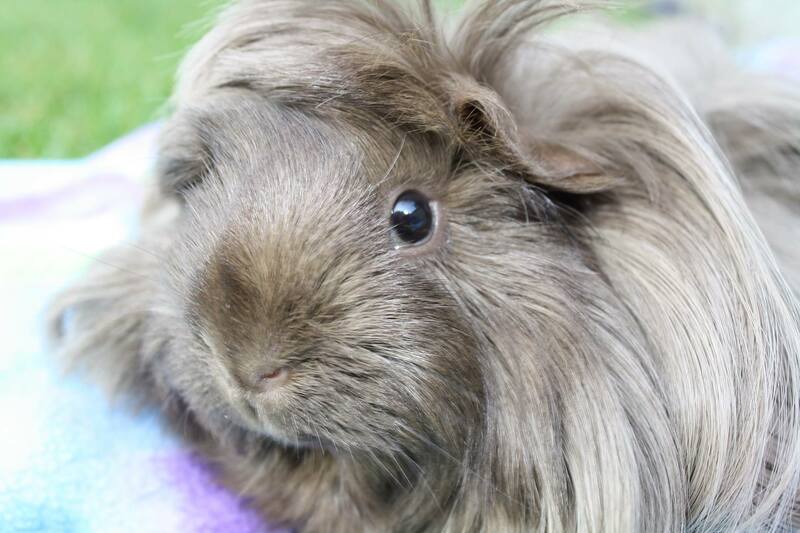 She cuts my bangs EVERY WHEEK! The rest of my hair can be longer or shorter. I like longer sweeps in the winter because it keeps my feet covered. But when she cuts my hair shorter, I popcorn around and swish and twist. It feels good. The worst part is bum baths. If mama thinks my bum is dirty, sometimes she just washes that. Humiliating! After she washes and dries it, she clips it really short. I fuss sometimes, but it feels better. I don’t like it when mama grooms near my bum to comb out the tangles and that’s the main reason mama gave up showing me. She loves me more than judges. Sometimes my nana helps cuddle me so mama can do a good short trim. I like to jump off my bucket onto mama’s shoulder to make her stop. It’s not really getting away… but she cuddles me close and gives me a break. Sometimes treats, too. Kirk: Tell me more about the other animals in your house. How do you get along with them? Maggie: Right now it’s just me. I’ve been unwell for the last six months, so mama’s been holding off with any changes to the family. Partly because she says I cost more money than a mint makes… and partly because I’m very possessive of her. If she smells like another animal, I sometimes attack and bite her. I don’t mean it… but how could she?! She tried to bond me with my mother awhile back, but it did not go very well. Lilac didn’t stay with us and mama cried. Mama thinks I need a friend. I only like pregnant pigs!! That’s all. And maybe one boy, named George Lucas. He’s also part of the royal family. Mama says I don’t need a boyfriend. I used to have a Jimmy friend who was a budgie. She died when I was about 8 months old and mama was very sad. Part of the reason mama picked me was so I could come here to help Jimmy feel less sad after mama’s last piggie, Oreo, passed. I don’t know if mama was ready for me so soon. Oreo and Jimmy were very good friends and shared veggies every night! I didn’t get to know Jimmy up close and personal because she had a stroke and couldn’t fly anymore. But she sang and talked to me from her cage. Mama brought me to her cage and Jimmy would climb down to me, nose to nose. She would groom my whiskers! Kirk: What is your favorite food? Why? 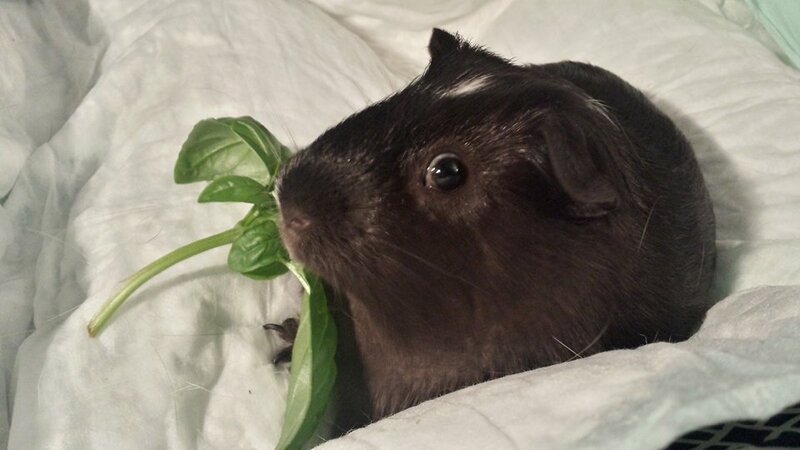 Maggie: My favourite food is definitely red swiss chard. It’s a very special treat because it’s crunchy and tasty and delicate. It has oxalates though, and mama has to be careful with plants like that because they can help make bladder stones. Since I only get chard once or twice a month…. My other favourite food might have to be cucumber. I rip it out of mama’s fingers and take it into my tunnel. I eat the green rind first. Then I eat the white part, carefully around and around. But I always leave the seeds. I don’t like seeds. Even strawberry ones! Maggie: Does sleeping count? In my Lego house. In my tunnels. On mama. In my hay pile. On my fleece in my poop corner. On nana. In my car carrier. In my cozy cup. On mama’s big bed in the sunshine at night when the sun sets. Out in the garden when my mama reads on the lounge chair. On our porch swing. In my vet’s baby scale. In the kitty tent. If sleeping can’t count, it would be when mama rubs my ears. Both of them together, between her thumb and index fingers. They’re hairy and it feels so good that I shut my eyes and I make a big sigh. Kirk: Well Maggie it was very nice interviewing you and I hope we’ll get the chance to talk more soon. 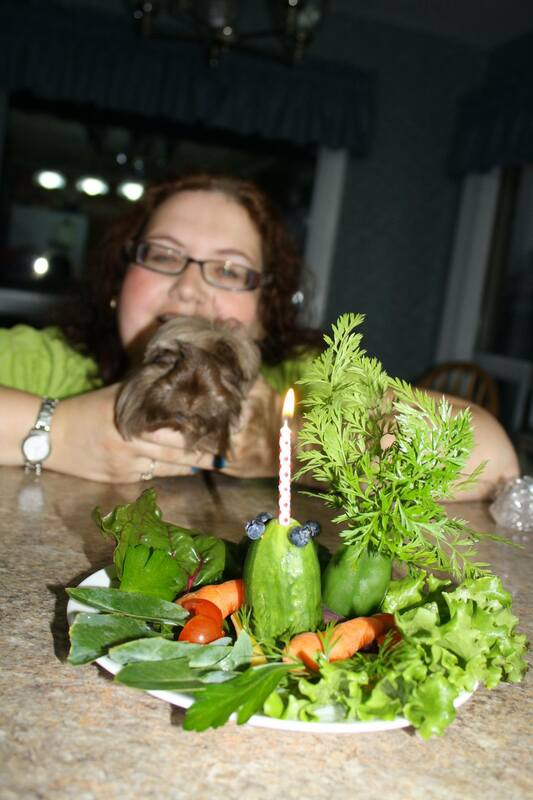 We will end tis post with a photo of Maggie at her first anniversary. Keep close for a next interview next Monday – a guy living with four girls!